Home » VW GTI » What’s inside the Golf GTI? The 2018 Volkswagen Golf GTI is a speedy and agile hatchback that is built with lots of features. These features are designed to give shoppers a better driving experience. Let’s take a look at the 2018 Volkswagen Golf GTI convenience features to show you just how comfortable a ride it can be. READ MORE: How much space is inside the Golf GTI? Inside the 2018 Volkswagen Golf GTI, you can seat up to five passengers. 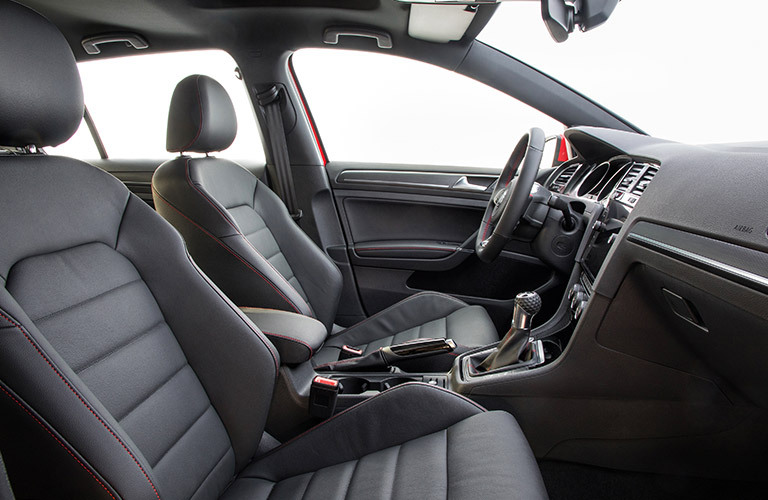 You can feel more relaxed inside the Golf GTI by wrapping your hands around the leather steering wheel. In the colder months you can warm up with the help of the standard heated front seats. The illuminated door sills and interior ambient lighting give the cabin a sharp look. If you are looking to make more space, the Golf GTI has a 60/40-split folding rear seat with center armrest and pass-through to help adapt to the occasion by giving you more room in the vehicle for your cargo. The entertainment system inside the 2018 Volkswagen Golf GTI comes standard with a 6.5-inch touch screen display and AM/FM radio. This sound system also has an integrated backup camera for easier exiting and parking. You have more music options in this vehicle with its Bluetooth® technology with audio streaming. There are lot of ways to listen to the music you love inside the Golf GTI. After looking at the 2018 Volkswagen Golf GTI convenience features, you can see that this model has a lot to offer drivers. Take a seat behind the wheel and feel the comfort for yourself at our dealership. If you want to learn more about the 2018 Volkswagen Golf GTI, you can check out our online inventory and schedule a test drive with us at Speedcraft Volkswagen today. This entry was posted on Monday, April 9th, 2018 at 4:17 PM	and is filed under VW GTI. You can follow any responses to this entry through the RSS 2.0 feed. You can leave a response, or trackback from your own site.